The cryptocurrency industry is one of the most fascinating evolutions in the financial world in many years. It can also be very confusing and challenging. As a CFR.Community Member you can face the challenges with friends and those with more experience in the industry. CFR also coaches and trains you and helps you get in early on the next potential BIG cryptocurrency winners (coins that can POTENIALLY go up in price 2X, 5X, 10X or more). Even very small savings in a few of these coins can potentially produce amazing results for you. Please see warnings and disclaimers below before you invest. "I have made 1900% on one of my CFR Alerts , 1600% on a second CFR Alert and 300% on a third CFR Alert. i invested 300.00 and made over 3400.00 in two months. I can't wait to see what the next months bring." Steven A. "I have been investing and trading Cryptocurrency for over a year now and the buy alerts that CFR puts out are the top coins to earn huge gains, there are now thousands of different Cryptos out there and before CFR sends out buy alerts they go through a vigorous research and investigation history of the project. This gives me great comfort in the potential investment before I begin my own research. CFR is a top notch community and out of hundreds of groups that I have been a part of in the last 6 years of online business' they are the #1 most honest and transparent." Jeff M.
"I acted on a CFR alert 22 days ago and to date I am up 270%. That is even after the recent plunge in coin prices. I was unable to get these coins until a month after the alert due to lack of funds. If I had gotten in when CFR sent the alert my returns would be much greater." Wesley A. "Here are a few examples of what I got: ADA coins I purchased on October 12th after the alert at 0.00000464 BTC is today at 0.00005342 BTC. Thats a 1,051 percent return. XML on October 16th, after the alert I got at 0.000007BTC is now at 0.00003950BTC. that's a 464 percent return. On average, on the coins I could purchase after Rick's alerts, I got more than 500 percent return. And I keep buying the coins Rick suggests on the alerts when I have funds to do so." Gerard S.
The above are real testimonials from real CFR Members. Testimonials are on file and available on request. learn all about : Smart Cryptocurrency Investing. We are Here For You Every Single Day. ✔✔ A great place for you to meet great people and become part of an amazing Community. You're never on your own at CFR. Someone is always willing to help around the clock. ✔✔ If you're a beginner, exact instructions how to buy and sell cryptocurrency. No more wondering and worrying what to do. ✔✔ Best resources which are continuously being updated. If it's cryptocurrency related we have it or we'll find it. 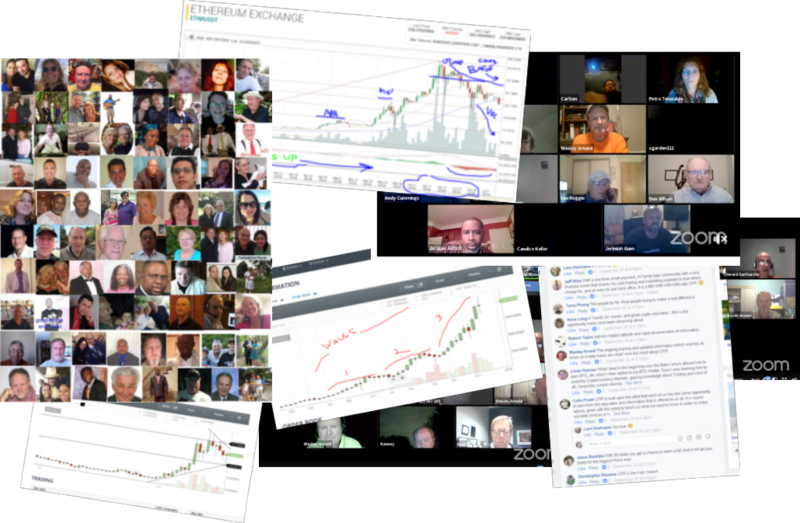 ✔✔ Private Member groups, live trainings and meetings, videos and text guides...we help everyone from beginner to experienced cryptocurrency investor navigate this exciting field on a daily basis. ✔✔ Everything related to Bitcoin and Cryptocurrency. Training, research, trading, investing and much more under one roof. resources, services, our private group and much more. **WARNING AND DISCLAIMER: CFR is strictly an information and educational membership site. We absolutely do not and can not guarantee any profits or income whatsoever.Trading and investing entails high risk. If you invest in cryptocurrencies it is possible to lose some or all of your investment. Past performance is not indicitive of future results. Never invest more than you can afford to lose. CFR offers both free and paid memberships to learn about cryptocurrency trading and investing as well as other educational programs. We also offer an optional affiliate program (our CFR Community Builder Awards program) which pays our affiliates on membership sales only. How much you can earn as a CFR Affiliate is completely dependent on your own sales and marketing ability. Chances are you will not earn any money as a CFR Affiliate or as a cryptocurrency trader or investor unless you study, learn and apply what you learn. Members are strongly encouraged NOT to trade or invest in cryptocurrencies if they are inexperienced until they spend time learning and practicing first. Neither CFR nor it's owners/partners are licensed or registered investment advisors or brokers. Information given is for information purposes only and we always encourage our Members to do their own research and study. Always check with your country and jurisdiction on their rules and laws regarding investments.